The Galaxy S8 is selling well – but not that well. Photo by Samsung on Flickr. Samsung announced today that first-month sales of its Galaxy S8 and S8 Plus have reached 5 million units. Sales of the previous year’s Galaxy S7 and S7 Edge sold an estimated 7-9 million units in their initial launch month, while back in 2013 Samsung announced its Galaxy S4 sold 10 million in its first month, a “Peak Galaxy” the company has never actually managed to surpass. A report by Cho Mu-Hyun for ZDNet noted the 5 million unit announcement, without any comparison to previous year sales. Each year since reaching Peak Galaxy in 2014, Samsung has floated the idea that its new model has outpaced sales, shipments (or sometimes “preorders”) of the previous edition, but in reality Galaxy S sales–and subsequently Samsung Mobile profits–have actually never recovered since the Galaxy S4. I’d noticed a report on that 5m elsewhere, but the lack of context – that it’s so much smaller in its first month – makes a big difference. Apple plans to announce an update to its laptop lineup at an annual conference for app developers in early June, a move that could help offset new competition from Microsoft as well as declining iPad sales. 1) There’s no chance Apple is in the least bit worried about Microsoft’s products – they just don’t sell well enough to worry it. 2) Declining iPad sales – well, they’re level if you leave out the iPad mini. And they sell wayy more, by unit, than Macs. I worked at Twitter for about six years. In that time, the service grew from zero people to hundreds of millions of people. Jack was the original CEO and when he returned I was very happy. There’s something about the personality of a company that comes from the folks who start it. There’s a special feeling they bring with them. Jack coming back was a big step forward. And now, it’s my turn—I’m returning to full time work at Twitter starting in a couple of weeks! How this came about is kind of a crazy story but, it’s happening. I’ve now lost count of how many times Stone has been in and out of Twitter. It’s a sort of Groundhog Day. I forget – does Jack Dorsey leave next and then Ev Williams comes back? Smartphone shipments reached 375m units in Q1 2017. The smartphone market grew 11.2% annually. • Premium segment ($400 above) smartphones now contribute to almost 20% of the global smartphone market. However, the segment declined annually due to softness in iPhone volumes and controlled inventory of the Samsung flagship Galaxy S7/S7+ ahead of Galaxy S8 series launch. • The ‘affordable premium’ segment $300~$399 was the fastest growing smartphone segment during the quarter mainly driven by OPPO, vivo and Samsung A series smartphones. • The $100~$199 price segment has quickly become the sweet spot across the pre-paid developed and emerging markets. 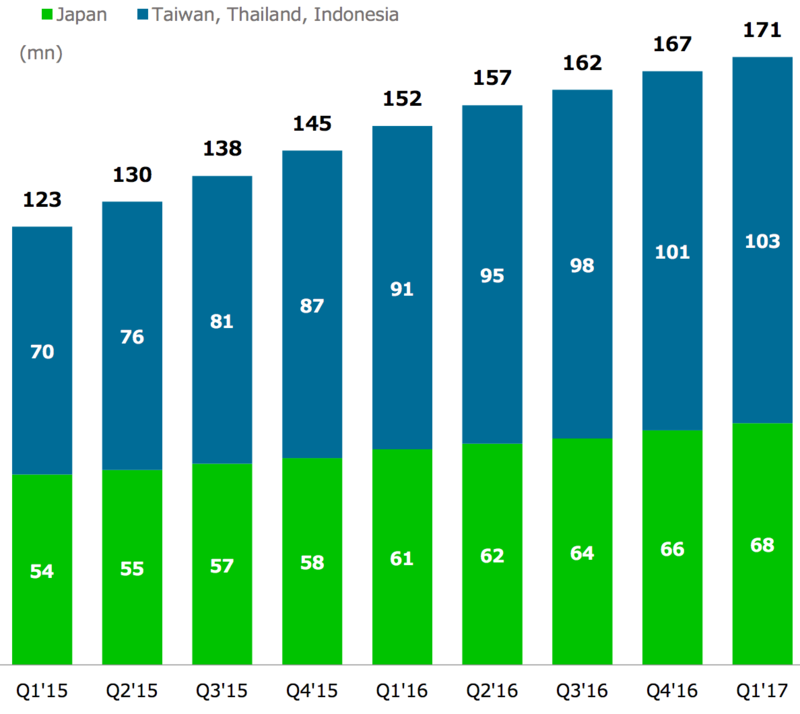 This segment accounts for one in three smartphones shipped globally, registering a healthy 28.8% growth in Q1 2017. • The $100~$199 price segment is mainly driven by Samsung’s J series, Huawei’s Honor series, OPPO’s A series and Xiaomi’s Redmi series smartphones. Together these brands accounted for almost half of the volumes of the price segment. Plenty of other interesting data – including Samsung getting extra inventory. Today, we’re introducing face filters in the camera, an easy way to turn an ordinary selfie into something fun and entertaining. 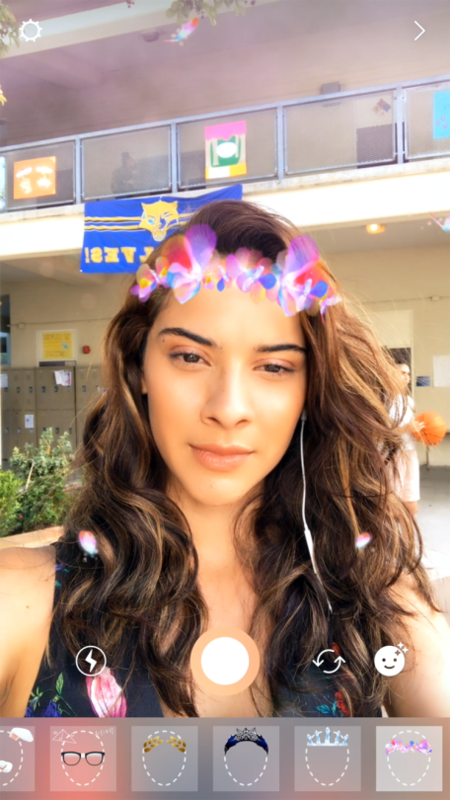 Whether you’re sitting on the couch at home or you’re out and about, you can use face filters to express yourself and have playful conversations with friends. It’s Snapchat for the over-30s. Also: so derivative. OK, not everyone is going to use Snapchat, and the idea of face filters isn’t new, but this starts to look like Microsoft copying MacOS back in the 1990s. The US$7.6bn company surprisingly did not disclose its total number of active users in its latest earnings report, which came out towards the end of last month – the first time it has not revealed that figure since late 2014. When I asked a Line Corp representative today, the individual explained that the total will only be revealed on a “reactive” basis in the future – i.e., when someone actually asks. Line – which makes money from ads and content in an array of spin-off apps and services such as Line Pay, Line Music, and Line Moments – focuses its business interests on those four markets, therefore those are where most of the money comes from. So as long as Line is growing in those four places, the company seems unperturbed by the loss of global users to the increasingly indispensable WhatsApp and Facebook Messenger. At least that’s the picture the company paints in public. Dropping users, though, is never good, which is why Twitter is always so keen to juice the figures. The spreading of Winthrop’s piece after it was debunked and branded “disputed” is one of many examples of the pitfalls of Facebook’s much-discussed initiatives to thwart misinformation on the social network by partnering with third-party fact-checkers and publicly flagging fake news. A Guardian review of false news articles and interviews with fact-checkers and writers who produce fake content suggests that Facebook’s highly promoted initiatives are regularly ineffective, and in some cases appear to be having minimal impact. Articles formally debunked by Facebook’s fact-checking partners – including the Associated Press, Snopes, ABC News and PolitiFact – frequently remain on the site without the “disputed” tag warning users about the content. And when fake news stories do get branded as potentially false, the label often comes after the story has already gone viral and the damage has been done. Good that someone is following this up. A group of cybersecurity experts has unearthed ties between an American hacker who maintains a neo-Nazi website and an internet campaign to smear Emmanuel Macron days before he was elected president of France. Shortly after an anonymous user of the 4chan.org discussion forum posted fake documents purporting to show Mr. Macron had set up an undisclosed shell company in the Caribbean, the user directed people to visit nouveaumartel.com for updates on the French election. That website, according to research by web-security provider Virtualroad.org, is registered by “Weevlos,” a known online alias of Andrew Auernheimer, an American hacker who gained notoriety three years ago when a US appeals court vacated his conviction for computer fraud. The site also is hosted by a server in Latvia that hosts the Daily Stormer, a neo-Nazi news site that identifies its administrator as “Weev,” another online alias of Mr. Aeurnheimer, Virtualroad.org says. “We strongly believe that the fake offshore documents were created by someone with control of the Daily Stormer server,” said Tord Lundström, a computer forensics investigator at Virtualroad.org. Otherwise known as Weev, who was sentenced to 41 months (then released and pardoned) for discovering a flaw in AT&T’s implementation of account security on iPads, and possibly compromised some national security folk. He was vaguely sensible back in those days. In other cases, the administration appears to be dimming the prior spotlight on the background and conduct of top officials. The administration no longer publishes online the ethics waivers granted to appointees who would otherwise be barred from joining the government because of recent lobbying activities. Nor is the White House releasing logs of its visitors, making it difficult for the public to keep track of who is stopping by to see the president’s inner circle. A reader requested on Tuesday to have fewer “inside Trump’s baseball-sized head” and more, where available, about what’s happening at the local level in the US. Point taken. This story is why that might become more difficult over time. First introduced in 2012, Apple’s iPad mini was a welcome alternative to the much larger, thicker, and heavier 9.7in iPad. There was no 5.5in iPhone Plus, so the iPad mini made a great choice for light reading and effortless web browsing, email, and gaming. The market doesn’t stand still, however, and we’re now looking at a redesigned iPad Pro to be launched this summer that should offer everything the current 9.7in iPad features, but in a smaller footprint with a larger 10.5in display. On the other side, there’s the 5.5in iPhone 7 Plus, which is large enough to negate the need for a tablet for many users. The device you take everywhere, that’s always with you, that has the best camera, and that has everything else you need. The device that you already own. Therein lies the problem, and that’s why we have heard from a source close to Apple that the iPad mini is being phased out. I’ve previously noted that Neil Cybart’s analysis suggests falling sales of the iPad mini are making the tablet market look sicker than it is. This would all fit into that. He called “peak iPad mini” in November 2015. I’d imagine they’ll just let it quietly slip out of sight by letting the existing inventory sell out. Lenovo has announced a plan to restructure and focus on its home market of China after two years of disappointing performance at what was the world’s top PC maker. Yang Yuanqing, chief executive, took to Weibo, the Chinese social media network, to declare that Lenovo would be reorganised into a consumer-facing division focused on personal computers and smart devices and a business-to-business division to house its data services. He also announced that Liu Jun, the respected executive who led the company’s 2014 acquisition of smartphone company Motorola Mobility from Google but left in 2014, would return to head the consumer division in its home market. Lenovo did not respond to requests for comment but an email from Mr Yang to employees that was leaked on Tuesday said improving performance in its home market was crucial after a 67% fall in profits in the final quarter of 2016. Lenovo still hasn’t put up its fiscal fourth-quarter results, nearly seven weeks after the end of the quarter (January-March). It’s amazingly sluggardly on this front. It’s also trying to turn a profit on Motorola Mobility, which has been a money pit for years, and its tablets, which break even at best. No wonder it’s reorganising. We drive through an entrance that takes us under the building and into the courtyard before driving back out again. Since it’s a ring, of course, there is no main lobby but rather nine entrances. [Jony] Ive opts to take me in through the café, a massive atrium-like space ascending the entire four stories of the building. Once it’s complete, it will hold as many as 4,000 people at once, split between the vast ground floor and the balcony dining areas. Along its exterior wall, the café has two massive glass doors that can be opened when it’s nice outside, allowing people to dine al fresco. Not just on its side; on its side and curved, ouroboros-style, into itself. The web page’s title is, wonderfully, “One More Thing”, because of course it was Steve Jobs who drove its creation. It’s his last act. As with pretty much all things Apple, Ive’s point will get missed in favour of LOOK AT THE BIG NUMBER. …MP3 is supported by everything, everywhere, and is now patent-free. There has never been another audio format as widely supported as MP3, it’s good enough for almost anything, and now, over twenty years since it took the world by storm, it’s finally free. While AAC still has patents, and Ogg Vorbis and Opus aren’t supported widely enough.